Systematic reviews incorporate information gathered from a large volume of primary research; however, it is often difficult to draw from this pooled data specific treatment techniques and dosages. Many clinicians have a positive attitude towards evidence-based practice, but may not have the time or resources to seek out the specific technique and dosage information from positive trials investigating the effectiveness of treatment strategies. Knowledge translation tools can be used to help clinicians access the evidence provided in systematic reviews and provide the specific technique and dosage information so that it can be implemented in clinical practice. The purpose of 'Manual therapy and exercise for neck pain: clinical treatment tool-kit' is to provide a resource for clinical decision making by providing evidence, techniques, and dosages for the use of manual therapy and exercise in the treatment of neck pain. The information contained in the 'Manual therapy and exercise for neck pain: clinical treatment tool-kit' is drawn from three of the Cervical Overview Group‘s (COG) systematic reviews, which include sixty randomized controlled trials on manual therapy and exercise for neck pain. This tool-kit was produced in association with the International Collaboration on Neck Pain (ICON), who evaluated the three systematic review included in this tool-kit at 8-9/12 using the 'Assessment of Multiple Systematic Reviews' (AMSTAR) methodological rating tool. It utilizes tables, pictures, and symbols to depict key positive or negative findings for specific techniques, dosages, and outcomes. Related disorder types (whiplash associated disorder, cervicogenic headache, radiculopathy), duration of disorder (acute, subacute, chronic) and follow-up periods (short, intermediate, and long-term – one two, or three GRADE symbols) characterize the findings. The 'Manual therapy and exercise for neck pain: clinical treatment tool-kit' has not been formally evaluated, but treatment recommendations are based on the Cochrane GRADE approach (high ♦, moderate •, low▲). The 'Manual therapy and exercise for neck pain: clinical treatment tool-kit' is meant to be applied judiciously. We suggest this tool be used as a resource to inform treatment decisions, but clinicians must understand that treatments should be individualized to each patient and that only the treatments that are within each clinician‘s scope and abilities should be performed. We suggest there are five steps in utilizing this tool-kit as a resource for clinical decision making (Figure 1). The user should identify characteristics of the patient they are treating in Step 1. 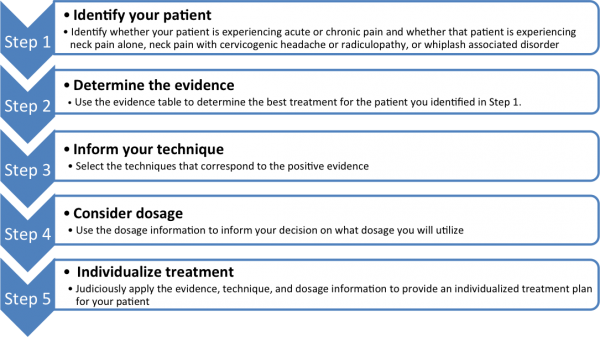 The evidence is depicted for each patient group in Step 2. The treatment techniques utilized in each positive trial are presented in Step 3 and the corresponding dosage in Step 4. Finally, Step 5 involves individualizing care to each individual patient. The tool-kit is interactive and will allow the participant to click on a link to directly go to the corresponding location in the next step. Figure 1. Five Steps that help make the evidence work for you. KayTM, Gross A, Goldsmith CH, Hoving JL, Santaguida PL, Rutherford S, McCall R, Voth S, Bronfort G. Exercises for neck pain. Cochrane Database of Systematic Reviews 2011 (update in progress). Gross A, Miller J, D’Sylva J, Burnie SJ, Goldsmith CH, Graham N, Haines T, Bronfort G, Hoving JL. Manipulation or mobilization for neck pain: a Cochrane Review. Manual Therapy 2010; 15(4):315-33. Allison GT, Nagy BM, Hall T. A randomized clinical trial of manual therapy for cervico-brachial pain syndrome e a pilot study. Manual Therapy 2002;7 (2):95-102. Bonk AD, Ferrari R, Giebel GD, Edelmann M, Huser R. Prospective, randomized, controlled study of activity versus collar, and the natural history for whiplash injury, in Germany. Journal of Musculoskeletal Pain 2000;8(1/2):123-32. Brodin H. Cervical pain and mobilization. International Journal of Rehabilitation Research 1984;7(2):190-1. - Brodin H. Cervical pain and mobilization. Manual Medicine 1985;2:18-22. Bronfort G, Evan R, Nelson B, Aker PD, Goldsmith CH, Vernon H. A randomized clinical trial of exercise and spinal manipulation for patients with chronic neck pain. Spine 2001;26(7):788-99. Giebel GD, Edelmann M, Huser R. Die distorsion der halswirbelsaule: Fruhfunktionalle vs. ruhigstellende behandlung. Zentralbibliotak Chiropractic 1997;122:517-21. Hoving JL, Koes BW, de Vet HCW, van der Windt DAWM, Assendelft WJJ, van Mameren H, et al. Manual therapy, physical therapy, or continued care by a general practitioner for patients with neck pain. A randomized controlled trial. Annals of Internal Medicine 2002;136:713-22. - Hoving JL, Koes BW, de Vet HCW, van der Windt DAWM, Assendelft WJJ, van Mameren H, et al. Manual therapy, physical therapy, or continued care by a general practitioner for patients with neck pain: long-term results from a pragmatic randomized clinical trial. Clinical Journal of Pain 2006;22(4):370-7. - Hoving JL, de Vet HCW, Koes BW, van Mameren H, Deville WJLM, van der Windt DAWM, et al. In: Hoving JL, editor. Manual therapy, physical therapy, or continued care by the general practitioner for patients with neck pain: long-term results from a pragmatic randomized trial. 1st ed. Wageningen: Pons & Looijen BV; 2001. p. 59-73. - Karlberg M, Magnusson M, Eva-Maj M, Melander A, Moritz U. Postural and symptomatic improvement after physiotherapy in patients with dizziness of suspected cervical origin. Archives of Physical Medicine and Rehabilitation 1996;77:874-82. - Korthals-de Bos IB, Hoving JL, van Tulder MW, Rutten-van Molken MP, Ader HJ, de Vet HC, et al. Cost effectiveness of physiotherapy, manual therapy, and general practitioner care for neck pain: economic evaluation alongside a randomized controlled trial. British Medical Journal 2003;326(7395):911. - Korthals-de Bos IB, Hoving JL, van Tulder MW, Rutten-van Molken MP, Ader HJ, de Vet HC, et al. Manual therapy is more cost-effective than physical therapy and GP care for patients with neck pain. 1st ed. Wageningen: Pons & Looijen BV; 2001. pp. 75-89. Jull G, Trott P, Potter H, Zito G, Niere K, Shirley D, et al. A randomized controlled trial of exercise and manipulative therapy for cervicogenic headache. Spine 2002;27(17):1835-43. Jull G, Sterling M, Kenardy J, Beller E. Does the presence of sensory hypersensitivity influence outcomes of physical rehabilitation for chronic whiplash? A preliminary RCT. Pain 2007;129:28-34. McKinney LA, Dornan JO, Ryan M. The role of physiotherapy in the management of acute neck sprains following road-traffic accidents. Archives of Emergency Medicine 1989;6(1):27-33. - McKinney MB. Behandlung der HWS-Distorsionen bei sog. Schleuderverletzungen. Orthopade 1994;23:287-90. Mealy K, Brennan H, Fenelon GC. Early mobilization of acute whiplash injuries. British Medical Journal 1986;92:656-7. Palmgren PJ, Sandstrom PJ, Lundqvist FJ, Heikkila H. Improvement after chiropractic care in cervicocephalic kinesthetic sensibility and subjective pain intensity in patients with nontraumatic chronic neck pain. Journal of Manipulative and Physiological Therapeutics 2006;29:100-6. Persson L, Karlberg M, Magnusson M. Effects of different treatments on postural performance in patients with cervical root compression. A randomized prospective study assessing the importance of the neck in postural control. Journal of Vestibular Research 1996;6(6):439-53. - Persson LCG, Carlsson CA, Carlsson JY. Long-lasting cervical radicular pain managed with surgery, physiotherapy, or a cervical collar. A prospective, randomized study. Spine 1997;22(7):751-8. - Persson LCG, Lilja A. Pain, coping, emotional state and physical function in patients with chronic radicular neck pain. A comparison between patients treated with surgery, physiotherapy or neck collar e a blinded, prospective randomized study. Disability and Rehabilitation 2001;23(8):325-35. - Persson LCG, Moritz U, Brandt L, Carlsson CA. Cervical radiculopathy: pain, muscle weakness and sensory loss in patients with cervical radiculopathy treated with surgery, physiotherapy or cervical collar. A prospective, controlled study. European Spine Journal 1994;6(4):256-66. Provinciali L, Baroni M, Illuminati L, Ceravolo MG. Multimodal treatment to prevent the late whiplash syndrome. Scandinavian Journal of Rehabilitation Medicine 1996;28:105-11. Skargren EI, Carlsson PG, Oberg BE. One-year follow-up comparison of the cost and effectiveness of chiropractic and physiotherapy as primary management for back pain. Spine 1998;23(17):1875-84. - Skargren EI, Oberg BE, Carlsson PG, Gade M. Cost and effectiveness analysis of chiropractic and physiotherapy treatment for low back and neck pain, Sixmonth follow-up. Spine 1997;22(18):2167-71. - Skargren EI, Oberg BE. Predictive factors for 1-year outcome of low-back and neck pain in patients treated in primary care: comparison between the treatment strategies chiropractic and physiotherapy. Pain 1998;77:201-7. Vasseljen O, Johansen BM, Westgaard RH. The effect of pain reduction on perceived tension and EMG-recoded trapezius muscle activity in workers with shoulder and neck pain. Scandinavian Journal of Rehabilitation Medicine 1995;27:243-52. Walker MJ, Boyles RE, Young BA, Strunce JB, Garber MB, Whitman JM, et al. The effectiveness of manual physical therapy and exercise for mechanical neck pain. Spine 2008;33(22):2371-8. Ylinen J, Takala EP, Nykanen M, Hakkinen A, Malkia E, Pohjolainen T, et al. Active neck muscle training in the treatment of chronic neck pain in women. JAMA 2003;289(19):2509-16. Allan M., Brantingham J.W. and Menezes A.. Stretching as an adjunct to chiropractic manipulation of chronic neck pain - before, after or not at all? A prospective randomized controlled clinical trial. European Journal of Chiropractic 2003;50:41-52. Andersen L, Kjaer M, Sogaard K, Hansen L, Kryger A and Sjogaard G. Effect of Two Contrasting Types of Physical Exercise on Chronic Neck Muscle Pain. Arthritis and Rheumatism 2008;59(1):84-91. Andersen LL., Saervoll Ca., Mortensen OS., Poulsen OM., Hannerz H., Zebis MK.. Effectiveness of small daily amounts of progressive resistance training for frequent neck/shoulder pain: Randomised controlled trial. Pain 2011;152:440-446. Ang B.O., Monnier A., Harms-Ringdahl K.. Neck/Shoulder Exercise for Neck Pain in Air Force Helicopter Pilots. Spine 2009;34(16):E544-E551. Chiu T, Huiu-Chan C, and Cheing G. A randomized clinical trial of TENS and exercise for patients with chronic neck pain. Clinical Rehabilitation 2005;19:850-60. Bronfort G, Aker PD, Evans R, Goldsmith CH, Nelson B, Vernon H. A randomized controlled clinical trial of rehabilitative exercise and chiropractic spinal manipulation for chronic neck pain. Spine 2001;26(7):788-99. - Bronfort G, Evan R, Nelson B. Aker PD, Goldsmith CH, Vernon H. A randomized controlled clinical trial of spinal manipulation and exercise for chronic neck pain: A report on neck performance outcomes after 11 weeks and long-term effects on patient-rated outcomes. In: Proceedings of the Scientific symposium, 1997 World Chiropractic Congress. 1998:62-8. - Bronfort G, Evans R, Nelson B, Aker PD, Goldsmith CH, Vernon H. A randomized controlled clinical trial of rehabilitative exercise and spinal manipulation for chronic neck pain. Effects on neck pain and disability, functional health status, biomechanical neck dysfunction, and somato-visceral symptoms. In: Proceedings of the 1998 International Conference of Spinal Manipulation. 1998:67-70. - Evans R, Bronfort G, Nelson B, Goldsmith C. Two-year follow-up of a randomized clinical trial of spinal manipulation and two types of exercise for patients with chronic neck pain. Spine 2002;27:2383-9. Franca DLM., Senna-Fernades V., Martins Cortez C., Jackson MN., Bernardo-Filho M., and Guimaraes MAM. Tension neck syndrome treated by acupuncture combined with physiotherapy: A comparative clinical trial (pilot study).. Complementary Therapies in Medicine 2008;16:268-277. Goldie I, Landquist A. Evaluation of the effects of different forms of physiotherapy in cervical pain. Scand J Rehab Med 1970;2-3:117-21. Hall T, Chan H, Christensen L, Odenthal B, Wells C, Robinson K. Efficacy of a C1-C2 Self-sustained Natural Apophyseal Glide (SNAG) in the Management of Cervicogenic Headache. Journal of Orthopaedic and Sports Physical Therapy 2007;37(3):100-7. Helewa A, Goldsmith C, Smythe H, Lee P, Obright K. Effect of Therapuetic esercise and Sleeping Neck Support on Patients with Chronic Neck Pain: A Randomized Clinical Trial. The Journal of Rheumatology 2007;34(1):151-58. Kjellman, G and Oberg B. A Randomized Clinical Trial Comparing General Exercise, Mckenzie Treatment and A Control Group In Patients with Neck Pain. Journal of Rehabilitation Medicine 2002;34:183-190. Kuijper B., Tans JT, Beelen A., Nollet F. and de Visser M.. Cervical collar or physiotherpay versus wait and see policy for recent onset cervical radiculopathy: randomised trial. BMJ 2009;339(b3883). Lundblad I, Elert J, Gerdle B. Randomized Controlled Trial of Physiotherapy and Feldenkrais Interventions in Female Workers with Neck-Shoulder Complaints. Journal of Occupational Rehabilitation 1999;9(3):179-94. Martel J., Dugas C., Dubois JD., Descarreaux M.. A randomised controlled trial of preventive spinal manipulation with and without a home exercise program for patients with chronic neck pain. BMC Musculoskeletal Disorders 2011;12:41-54. Rendant D, Pach D, Ludtke R, Reishauer A, Mietzner A, Willich SN, Witt CM. Qigong versus exercise versus no therapy for patients with chronic neck pain. Spine 2011;36(6):419-29. Revel M, Minguet M, Gergoy P, Vaillant J, Manuel JL. Changes in cervicocephalic kinesthesia after a proprioceptive rehabilitation program in patients with neck apin: a randomized controlled study. Archives of Physical Medicine Rehabilitation 1994;75:895-9. Stewart MJ., Maher CG., Refshauge KM., Herbert RD., Bogduk N., Nicholas M. Randomized Controlled trial of exercise for chronic whiplash-associated disorders. Pain 2007;128:59-68. Stewart MJ., Maher CG., Refshauge KM., Herbert RD., Bogduk N., Nicholas N. Advice or exercise for chronic whiplash disorders? Design of a randomized controlled trial. BMC Musculoskeletal Disorders 2003;4:18. Stewart MJ., Maher CG., Refshauge KM., Herbert RD., Nicholas MK. Patient and clinician treatment preferences do not moderate the effect of exercise treatment in chronic whiplash-associated disorders. European Journal of Pain 2008;12:879-885. Takala EP, Viikari-Juntura E, Tynkkynen EM. Does group gymnastics at the workplace help in neck pain? A controlled study. Scandinavian Journal of Rehabilitation Medicine 1994;26:17-20. Viljanen M, Malmivaara A, Uitti J, Rinne M, Palmroos P and Laippala. Effectiveness of dynamic muscle training, relaxation training, or ordinary activityy for chronic neck pain: randomized controlled trial. BMJ 2003;327:475-480.
von Trott P., Wiedemann A, Ludtke R., reibhauer A., Willich ST., and Witt CM.. Qigong and exercise therapy for elderly patients with chronic neck pain (QIBANE): A randomized controlled study. The Journal of Pain 2009;10(5):501-508. Bitterli J, Graf R, Robert F, Adler R, Mumenthaler M. Zur objectivierung der manualtherapeutischen beeinflussbarkeit des spondylogenen kopfschmerzes. Nervenarzt 1977;48:259–62. Cassidy J [letter]. The immediate effect on manipulation vs mobilization pain and range of motion in the cervical spine: A randomized controlled trial. Journal of Manipulative and Physiological Therapeutics 1993;16(4):279–80. - Cassidy JD, Lopes AA, Yong-Hing K. The immediate effect of manipulation versus mobilization on pain and range of motion in the cervical spine: A randomized controlled trial. Journal of Manipulative and Physiological Therapeutics 1992;15(9):570–5. Chen L, Zhang XL, Ding H, Tao YQ, Zhan HS. Comparative study on effects of manipulation treatment and transcutaneous electrical nerve stimulation on patients with cervicogenic headache. Journal of Chinese Integrative Medicine 2007;5(4):403–6. Cleland JA, Childs Maj. JD, McRae M, Palmer JA, Stowell T. Immediate effects of a thoracic manipulation in patients with neck pain: A randomized clinical trial. Manual Therapy 2005;10: 127–35. Coppieters MW, Stappaerts KH, Wouters LL, Janssens K. Aberrant protective force generation during neural provocation testing and the effect of treatment in patients with neurogenic cervicogenic pain. Journal of Orthopaedic Sports Physical Therapy 2002 (submitted). Coppieters MW, Stappaerts KH, Wouters LL, Janssens K. The immediate effects of a cervical lateral glide treatment technique in patients with neurogenic cervicobrachial pain. Journal of Orthopedic and Sports Physical Therapy 2003;33:369–78. David J, Modi S, Aluko AA, Robertshaw C, Farebrother J. Chronic neck pain: A comparison of acupuncture treatment and physiotherapy. British Journal of Rheumatology 1998;37:118–22. Eqwu MO. Relative therapeutic efficacy of some vertebral mobolization techniques in the management of unilateral cervical spondylosis: a comparitive study. Journal of Physical Therapy and Science 2008;20:103–8. Fernandez-de-las-Penas C, Fernandez-Carnero J, Plaza Fernandez A, Lomas-Vega R, Miangolarra-Page JC. Dorsal manipulation in whiplash injury treatment: A randomized controlled trial. Journal of Whiplash & Related Disorders 2004;3:55–71. Giles LGF, Muller R. Chronic spinal pain syndromes: A clinical pilot trial comparing acupuncture, a nonsteroidal anti-inflammatory drug, and spinal manipulation. Journal of Manipulative and Physiological Therapeutics 1999;22(6):376–81. Gonzalez-Iglesias J, Fernandez-De-Las-Penas C, Cleland JA, Del Rosario Gutierrez-Vega M. Thoracic spine manipulation for the management of paitents with neck pain: a randomized clinical trial. Journal of Orthopaedic and Sports Physical Therapy 2009;39(1):20–7. Haas M, Groupp E, Aickin M, Fairweather A, Ganger B, Attwood M, et al.Dose response for chiropractic care of chronic cervicogenic headache and associated neck pain: A randomized pilot study. Journal Manipulative and Physiological Therapeutics 2004;27:547–53. Howe DH, Newcombe RG, Wade MT. Manipulation of the cervical spine - a pilot study. Journal of the Royal College of General Practitioners 1983;33:574–9. Hurwitz EL, Morgenstern H, Harber P, Kominski GF, Yu F, Adams AH. A randomized trial of chiropractic manipulation and mobilization for patients with neck pain: Clinical outcomes from the UCLA Neck-Pain Study. Research and Practice 2002;92(10):1634–41. Kanlayanaphotporn R, Chiradejnant A, Vachalathiti R. The immediate effects of mobilization technique on pain and range of motion in patients presenting with unilateral neck pain; A randomized controlled trial. Archives of Physical Medicine and Rehabilitation 2009;90:187–92. Kanlayanaphotporn R, Chiradejnant A, Vachalathiti R. Immediated effects of the central posteroanterior mobilization technique on pain and range of motion in patients with mechanical neck pain. Disability and Rehabilitation 2010;32(8):622-8. Krauss J, Creighton D, Ely JD, Podlewska-Ely J. The immediate effects of upper thoracic translatoric spinal manipulation on cervical pain and range of motion: a randomized clinical trial. The Journal of Manual and Manipulative Therapy 2008;16(2):93–9. Martinez-Segura R, Fernandez-de-las-Penas C, Ruiz-Saez M, Lopez-Jimenez C, Rodriguez-Blanco C. Immedicate effects on neck pain and active range of motion after a single cervical high-velocity low amplitude manipulation in subjects presenting with mechanical neck pain: A randomized controlled trial. Journal of Manipulative and Phyiological Therapeutics 2006;29:511–7. Muller R, Giles LGF. Long-term follow-up of a randomized clinical trail assessing the efficacy of medication , acupuncture, and spinal manipulation for chronic mechanical spinal pain syndromes. Journal of Manipulative and Physiological Therapeutics 2005;28:3–11. Nilsson N. A randomized controlled trial of the effect of spinal manipulation in the treatment of cervicogenic headache. Journal of Manipulative and Physiological Therapeutics 1995;18(7):435–40. - Nilsson N, Christensen HW, Hartvigsen J. Lasting changes in passive range of motion after spinal manipulation: A randomized, blind, controlled trial. Journal of Manipulative and Physiological Therapeutics 1996;19(3):165–8. - Nilsson N, Christensen HW, Hartvigsen J. The effect of spinal manipulation in the treatment of cervicogenic headache. Journal of Manipulative and Physiological Therapeutics 1997;20(5):326–30. Parkin-Smith GF, Penter CS. A clinical trial investigating the effect of two manipulative approaches in the treatment of mechanical neck pain: A pilot study. Journal of the Neuromusculoskeletal System 1998;6(1):6–16. Savolainen A, Ahlberg J, Nummila H, Nissinen M. Active or passive treatment for neck-shoulder pain in occupational health care? A randomized controlled trial. OccupationalMedicine 2004; 54:422–4. Sloop PR, Smith DS, Goldenberg E, Dore C. Manipulation for chronic neck pain: A double-blind controlled study. Spine 1982;7 (6):532–5. Strunk RG, Hondras MA. A feasibility study assessing manual therapies to different regions of the spine for patients with subacute or chronic neck pain. Journal of chiropractic medicine 2008;7:1–8. 24) van Schalkwyk R, Parkin-Smith GF. A clinical trial investigating the possible effect of the supine cervical rotatory manipulation and the supine lateral break manipulation in the treatment of mechanical neck pain: A pilot study. Journal of Manipulative and Physiological Therapeutics 2000;23(5):324–31. 25) Vernon HT, Aker P, Burns S, Viljakaanen S, Short L. Pressure pain threshold evaluation of the effect of spinal manipulation in the treatment of chronic neck pain: A pilot study. Journal of Manipulative and Physiological Therapeutics 1990;13(1):13–6. 26) Wood TG, Colloca CJ, Matthews R. A pilot randomized clinical trial on the relative effect of instrumental (MFMA) versus manual (HVLA) manipulation in the treatment of cervical spine dysfunction. Journal of Manipulative and Physiological Therapeutics2001;24(4):260–71. 27) Yurkiw D, Mior S. Comparison of two chiropractic techniques on pain and lateral flexion in neck pain patients: a pilot study. Chiropractic Technique 1996;8(4):155–62. Basmajian JV, Nyberg R, eds. Rational Manual Therapies. Baltimore: Williams & Wilkins; 1993. Bergmann TF, Peterson DH, Lawrence DJ. Chiropractic technique: principles and practice. New York, NY7 Churchill Livingstone; 1993. p. 123-522. Biondi DM. Cervicogenic headache: a review of diagnostic and treatment strategies. J Am Osteopath Assoc 2005; 105(4 Suppl 2):s16-s22. Bourdillon JF (1975). Spinal manipulation. London: Heinemann. Cookson JC. Orthopedic manual therapy—an overview. Part II: the spine. Phys Ther. 1979;59:259-67. Croft AC. Management of soft tissue injuries in whiplash injuries. In: Foream SC, Croft AC (Eds.). The cervical acceleration/deceleration syndrome.2nd edition. Baltimore: Williams and Wilkins: 1995. pp.450-488. Cyriax J (1971). Textbook of orthopaedic medicine, Vol II. Eighth edition. London, Bailliere Tindall. Dyrssen T, Svedenkrans M, Paasikivi J. Muskeltraning vid besvar i nacke och skuldror effektiv behandling for att minska smartan. Lakartidningen 1989; 86:2116–20. Elvey RL, Hall TM (1997). Neural tissue evaluation and treatment. Physical Therapy of the Shoulder. Churchill Livingstone,New York. Feldenkrais M (1987). Awareness through movement. Aylesbury: Penguin Books Ltd.
Gam AN.Warming S, Larsen LH et al. Treatment of myofascial trigger points with ultrasound combined with massage and exercise-a randomised controlled trial. Pain 1998; 77:73-9. Gibbons P, Tehan P. Manipulation of the spine, thorax and pelvis. Edinburgh7 Churchill Livingstone; 2000. Gross AR, Aker PD, Quartly C. Manual therapy in the treatment of neck pain. Rheum Dis Clin North Am. 1996;22:579-98. Haldeman S, Phillips RB. Spinal manipulative therapy in the management of low back pain. In: Frymoyer JW, Ducker TB, Hadler NM, et al, eds. The Adult Spine: Principles and Practice. New York: Raven Press, 1991:1581–605. Hall CM, Brody LT (1999). Therapeutic exercise: moving toward function. Philadelphia, PA: Lippincott Williams & Wilkins. Highland TR, Dreisinger TE, Vie LL, et al. Changes in isometric strength and range of motion of the isolated cervical spine after eight weeks of clinical rehabilitation. Spine 1992;17:S77–82. Jacobsen E (1938). Progressive relaxation. 2nd ed. Chicago: University of Chicago Press. Jull GA. The management of cervicogenic headache. Manual Ther 1997;2: 182–90. Jull GA, Barrett C, Magee R, Ho P. Further clarification of musculoskeletal dysfunction in cervical headache. Cephalalgia 1999; 19: 179-85. Jull G, Trott P, Potter H, Zito G, Niere K, Shirley D, et al. A randomized controlled trial of exercise and manipulative therapy for cervicogenic headache. Spine 2002;27:1835–43. Jull G, Treleaven J, Falla D, Sterling M, O’Leary S. A therapeutic exercise approach for cervical disorders. In: Boyling J, Jull G, editors. Grieves’ modern manual therapy of the vertebral column. Edinburgh: Churchill Livingstone, Elsevier; 2004. p. 451–70. Kaltenborn F (1993). The spine. Basic evaluation and mobilization techniques. Oslo: Olaf Norlis Bokhandel. Lewit K. Manipulative therapy in rehabilitation of the locomotor system. 2nd ed. Oxford: Butterworth-Heinemann, 1991. Maigne R (1972). Doeleurs d’origine vertebrale et traitements par manipulations. Paris: Expansion scientifique. Maigne R. Responsabilite du rechis cervical dans les cephalees communes. Leur traitement. Cinesiologie 1972; 13:1-10. Maigne R (1972). Orthopaedic medicine: A new approach to vertebral manipulation. Springfield, Charles C Thomas. Maitland GD (1968). Vertebral manipulation. Second edition. London, Butterworths. Maitland GD, Hengeveld E, Banks K, et al. Maitland’s Vertebral Maniplation. 6th ed. London: Butterworth, 2000. Maitland GD, Hengeveld E, Banks K, English K. Maitland’s vertebral manipulation. London: Butterworth; 2005. Matthews JA (1972). The scope of manipulation in the management of rheumatic disease. Practitioner 208:107. McKinneyLA. Dornan JO. RyanM. The role of physiotherapy in the management of the acute neck sprain following road traffic accidents. Archives Emergency Medicine 1989; 6: 27-33. Mealy K, Brennan H, and Fenelon GCC. Early mobilization of acute whiplash injuries. BMJ 1986; 292:656-7. Mulligan BR. Manual Therapy NAGS SNAGS MWMS etc. Wellington, New Zealand: Plane View Services; 2004. Nelson BW, Carpenter DM, Dreisinger TE, et al. Can spinal surgery be prevented by aggressive strengthening exercises? A propspective study of cervical and lumbar patients. Arch Phys Med Rehabil 1999;80:20–5. Nicholson GG, Clendaniel RA. Manual Techniques. In: Scully RM, Barnes MR, editors. Physical Therapy. Philadelphia, PA7 JB Lippincott Company; 1989. p. 926-85. Pollock ML, Graves JE, Bamman MM et al.Frequency and volume of resistance training: Effect on cervical extension strength. Arch Phys Med Rehabil 1993; 74: 1080-86. Provincialli L, Baroni M, Illuminati L et al. Multimodal treatment to prevent the late whiplash syndrome. Scandinavian Journal of Rehabilitation Medicine 1996; 28:105-11. Radanov BP, Di Stefano G, Schnidring A, Ballinari P. Role of psychosocial stress in recovery from common whiplash. Lancet 1991; 338: 7112-5. Revel M, Minguet M, Gergoy P, Vaillant J, Manuel JL. Changes in cervicocephalic kinesthesia after a proprioceptive rehabilitation program in patients with neck pain: a randomized controlled study. Arch Phys Med Rehabil 1994;75:895–9. Shutty MS Jr, Dowdy L, McMahon M, Buckelew SP. Behavioural treatment of dizziness secondary to benign positional vertigo following head trauma. Arch Phys Med Rehab 1991; 72:473-6. Soderland A, Olerud C, Lindberg P. Acute whiplash associated disorder (WAD): The effects of early mobilization and prognostic factors in long term symptomatology. Clinical Rehabillitation 2000; 14(5):457-67. Still AT. Osteopathy: research and practice. Seattle: Eastland Press; 1992. Stoddard A (1959). Manual of osteopathic technique. Hutchinson, London. Sweeney T. Neck school: Cervicothoracic stabilization training. Occup Med 1992; 7:43-54. Travell JG, Simons DG. Myofascial pain and dysfunction: the trigger point manual. Baltimore, MD7 Williams & Wilkins; 1983. p. 1-713. Van der EL, Lunacek PB, Wagemaker AJ. Manuele Therapie: wervelkolom behandeling [Manual Therapy: Treatment of the Spine]. 2nd ed. Rotterdam: Manuwel; 1993. Wiedemann AM, von Trott P, Lüdtke R, Reisszlihauer A, Willich SN, Witt CM. Developing a qigong intervention and an exercise therapy for elderly patients with chronic neck pain and the study protocol. Forsch Komplementmed. 2008;15(4):195-202.